October 2018: A Fun & Spooktacular October! Halloween Happiness at Shear Madness! Are you looking for something fun and memorable to do this Halloween? If so, be sure to check out all the the fun activities planned throughout October at your participating Shear Madness Haircuts for Kids locations by clicking Halloween Happiness! Also during October all of our temporary hair coloring products are 10% Off! Want more details? 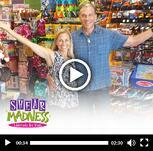 Call your local Shear Madness to find out more about all the cool stuff they have planned. Click here for a list of locations and contact info. Have FUN! Helping Kids with Knock your Locks Off! Every child matters at Shear Madness Haircuts for Kids! That's why we love our annual "Knock Your Locks Off" event (scheduled for October 12-14th), which helps provide hairpieces to kids under age 21 suffering from long-term medical hair loss from any diagnosis. If your child has at least 12" of hair to donate, they can participate. Participants will receive a free haircut, Locks of Love Certificate with a before and after photo. (details vary by participating locations), Shear Madness locations will donate to Locks of Love or Wigs for Kids (click prior links for hair requirements)! Check out the Shear Madness website for more information about this cool way to help others. And be sure to call for details and to schedule your appointment for this special occasion! Are you looking for an opportunity to diversify your portfolio, or gain more financial security for the future? Or maybe you just want a change of pace, and want to find a way to make a positive difference? Whatever the case may be, Shear Madness Haircuts for Kids is currently experiencing rapid growth in the highly profitable hair salon industry. 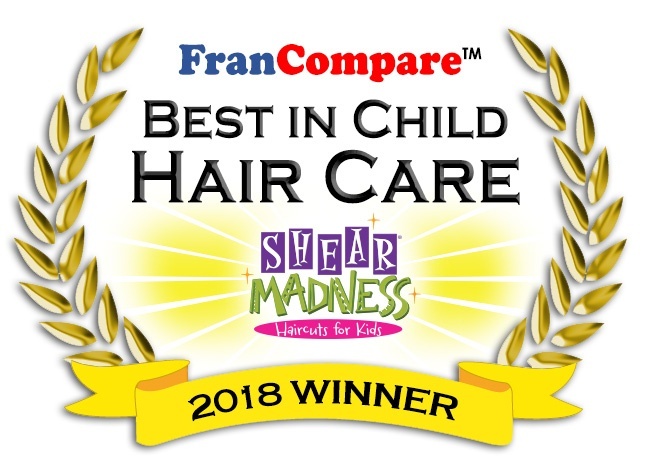 And with opportunities all across the U.S to own your own kids hair salon business, perhaps now is the time to take the first step towards becoming a part of the Shear Madness family! For more information on how you can make a positive difference in the lives of kids and their parents in YOUR community, check us out at Franchise Opportunities, or visit us at our blog! You can also call us at 1-888-98 GONE MAD! WOW! 40,000 Fans on Facebook! Did you know that Shear Madness Haircuts for Kids has around 40,000 fans just like you on our Facebook page? That's because we LOVE sharing the FUN with funny jokes for kids, craft ideas, great photos shared by our customers, awesome feedback, the latest Shear Madness news, in-store specials and so much more! Also, don't forget to check out our Google+, Instagram, Twitter, Tumblr and Pinterest pages! And check out our Franchise Blog for great business tips and more! Monstrously Good Savings! Right now, get our special coupon for 10% OFF any Hair Styling Product (Just in case you want to impress your friends with your stylin' hair at an upcoming Halloween party, hay-ride or Fall festival)! We also have great savings for Ty products and Gift Certificates (which make GREAT gifts) for Christmas - which will be here sooner than you know it! Don't miss out, head over to our coupon page for these awesome savings! Halloween Crafts and More! Check out our cool Crafts for Kids section on Pinterest, and make something spooktacular for your home this Fall! For example, make some Halloween hand sanitizer, puffy ghosts, cute little pinecone owls (with witch hats), a silly spider hat, a fun Halloween themed game for kids, paper bag monsters (as pictured at left) and awesome bats made from paper towel tubes! Have a safe and super FUN October!